How to Fix “Your OneDrive folder can’t be created in the location you selected” on Windows 10? Home »	Fix » How to Fix “Your OneDrive folder can’t be created in the location you selected” on Windows 10? Issue: How to Fix “Your OneDrive folder can’t be created in the location you selected” on Windows 10? When I attempt to install OneDrive on my Windows 8, I receive an error during the install – “Your OneDrive folder can't be created in the location you selected.” I tried to save it to the other drive, created a new profile, but neither of these solutions helped. Anybody have any ideas? OneDrive is a cloud storage application released by Microsoft and pre-installed into Windows 10 by default. Millions of people are using OneDrive services, including but not limited to file uploading, storing, and transmission. Unfortunately, the app triggers issues on Windows OS quite frequently. To name a few, we would mention the high CPU usage by OneDriveSetup.exe, “Connecting to d.docs.live.net” when opening Microsoft Office files or irritating “Set Up OneDrive” pop-up. The location you were trying to create OneDrive folder belongs to drive with an unsupported file system. To have OneDrive use a different location, click Set up OneDrive and point OneDrive to an NTFS drive. To use the existing location with OneDrive, you need to format it with NTFS and then click Set up OneDrive to continue your account. The culprit of the “Your OneDrive folder can’t be created in the location you selected” error is the format of a drive on which you want to save the OneDrive folder. Currently, the drive has to be formatted using NTFS file system to store OneDrive folder. If yours is formatted using FAT32, exFAT, or ReFS file system, OneDrive prevents the user from saving OneDrive folder in a other than NTFS formatted drive. OneDrive folder is stored in C:\\Users\\YourUserName by default. If you cannot save the OneDrive in a particular drive, you should shift the folder of One Drive to the drive, which is formatted using the NTFS file system. When the “Your OneDrive folder can’t be created in the location you selected” error shows up, click Set up OneDrive button. If you are currently not seeing the alert, you can double-click on the OneDrive icon located in the notification area. Enter your Microsoft account email address and click Sign-In. Type your account password and click Sign-In. Now click Change location link and select the drive, which is formatted using NTFS file system. Finally, follow the on-screen instructions to set up OneDrive completely. IMPORTANT: If you don’t know which drive is formatted with NTFS, navigate to This PC and right-click on the drive icon. Select Properties and check the on the General tab. 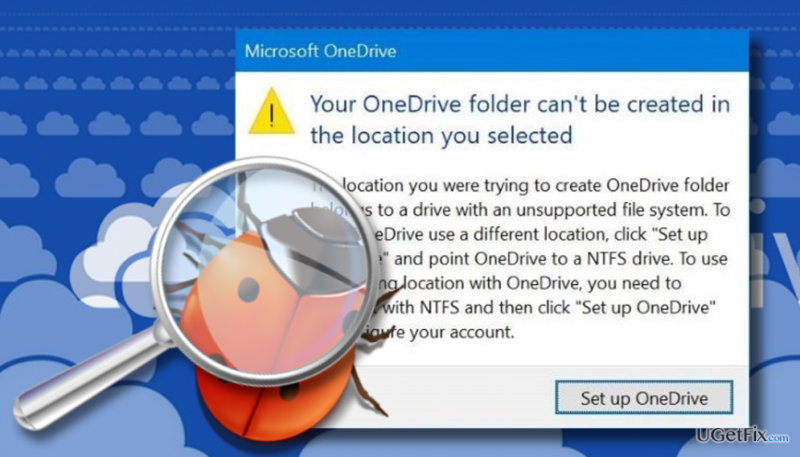 If, unfortunately, you don’t have a drive formatted with NTFS, the solution to fix “Your OneDrive folder can’t be created in the location you selected” error is to format the drive with NTFS file system and reinstall Windows 10. Be careful and create backups of the files stored on your PC because all data will be removed after Windows 10 reinstall.